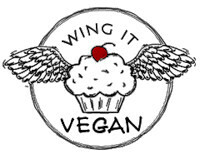 Wing It Vegan: They're heeeere! 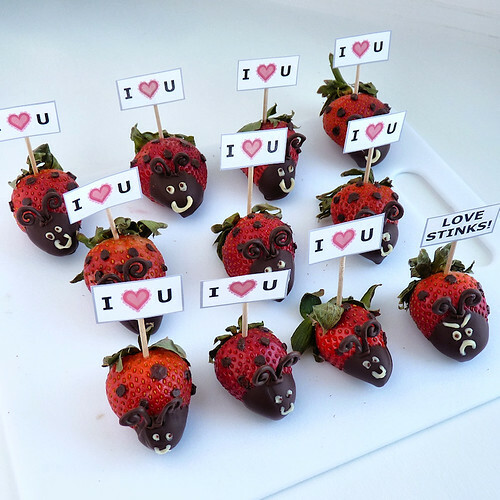 Vegantine's Day Strawberry Love Bugs! They're heeeere! 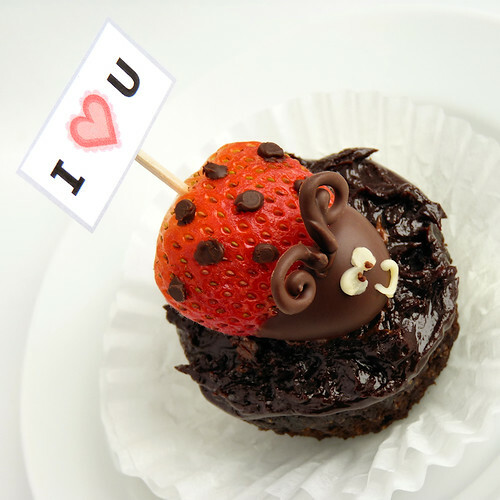 Vegantine's Day Strawberry Love Bugs! Brace yourself for the post with the most pictures eva'! It will hog up all your bandwidth! It will break the interwebs! The planet will implode! The Strawberry Love Bugs are back! Remember the ones I made in 2009? These are pretty much the same, except that I printed out their little signs instead of handwriting them. Which one are you teaming up with for Vegantine's Day? 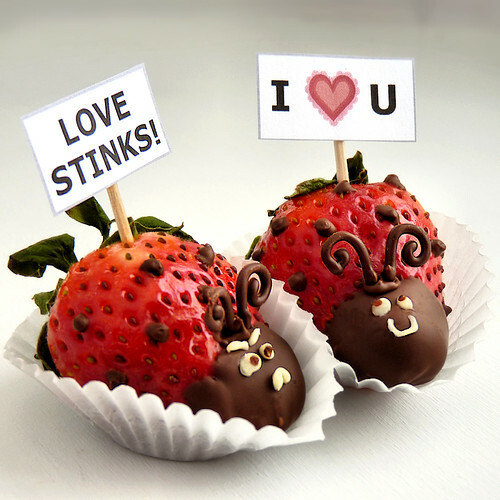 I *heart* You or Love Stinks? If you've been reading my blog for a while, then you probably know that I always like to throw in a Mr. Grumpy Pants along with the happy faces. You know, for balance. Then you're going to need about two ounces of melted semi-sweet chocolate chips. I melt mine in the microwave at half power, stirring every 45 seconds. If you're a proper double-boiler person, then go for it. 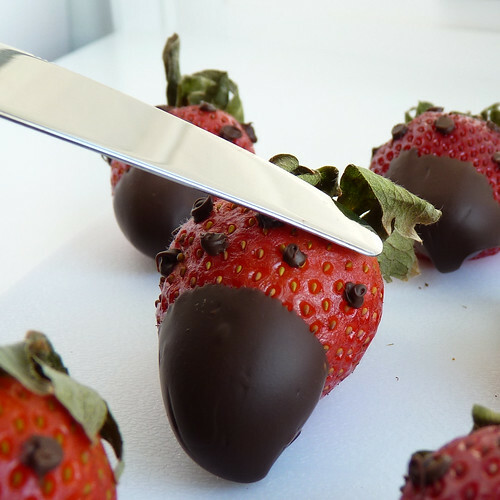 Refrigerate the strawberries while you make the antennae. The antennae are totally optional. I'm not going to lie to you, they can be a pain in the gluteus maximus to make. 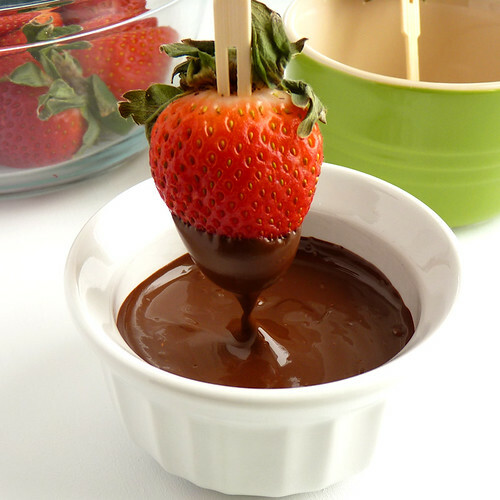 If you want to make them, check if your melted chocolate needs a few more seconds in the microwave to soften it up. Mine did. Then transfer it to a small ziploc bag and cut a small tip off one of the corners. 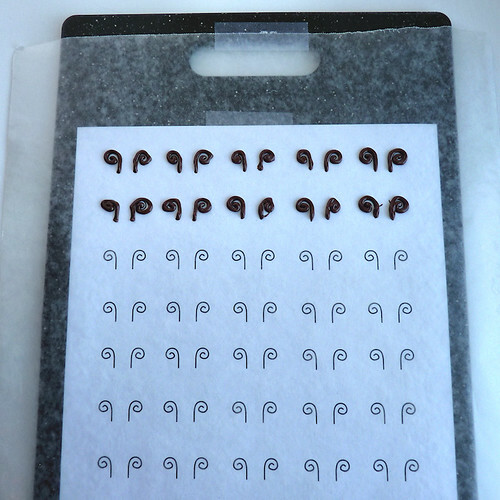 You can print out my antennae pattern if you would like to use it, then tape the pattern to a chopping board and tape a piece of wax paper on top of the pattern paper. When you're ready, use your chocolate-loaded ziploc bag to trace the little swirly antennae. If you have no idea how to do that, check out my chocolate spider-legs video that might paint a clearer picture. Place the chopping board in the freezer and let's make some buggy dots! 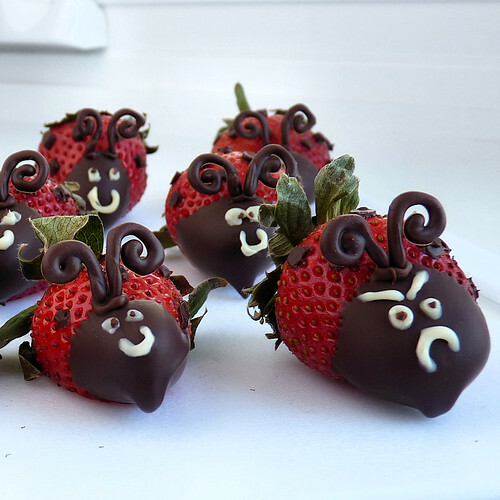 Use the same ziploc to drop little dots all over the tops of the strawberries, except for the "heads", of course. This next step is also optional, but I like to flatten the chocolate dots with a hot (dry!) knife. Now it's time to draw some eyes and mouths on'em. I used melted vegan white chocolate chips, but you can also make them with a very stiff powdered sugar and water icing. Use another ziploc to pipe the melted chocolate or sugar icing and draw their little faces. Mr. Grumpy Pants will need a pair of grumpy eyebrows. Now pipe a little drop of the melted semi-sweet chocolate in the center (or not!) of each eye. Or you can dip a toothpick into the melted chocolate and then "poke" the center of each eye with it. Also, this would be a good time to attach the antennae. Use a generous drop of melted chocolate as glue, on top of their heads, and then quickly attach the antennae. If your hands are too warm and the antennae melt in your hands, you can always use some food-exclusive tweezers to grab them. Now they need their signs! You can make your own or you can print mine out if you want. I *heart* You signs are here, and Love Stinks signs are here. Your choice! 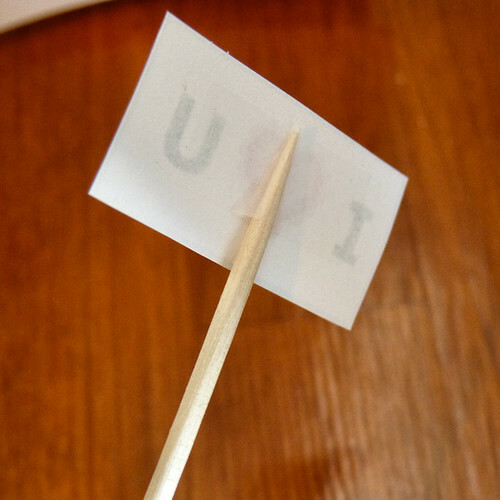 Just cut out the signs and tape a toothpick to the back of each sign. Insert the signs into the top/back of each Love Bug and you're done! A nice little row of bugs, coming to steal your heart! They also make cute cupcake toppers! oh my goodness, that little love stinks one is beyond adorable! those are super adorbs! 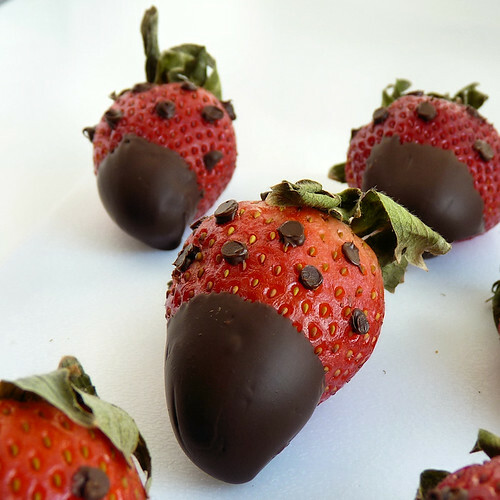 If I wasn't feeling so lazy about Valentine's this year I'd totally make these for friends! Wow! 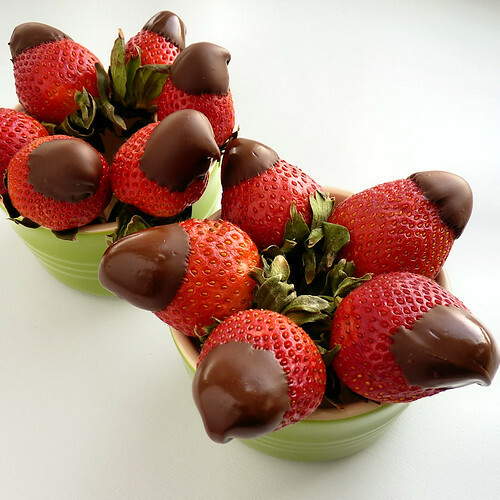 Those are the cutest strawberries I have ever seen! Those are so freakin cute! Seriously, you need to make a holiday e-book because you always have the cutest holiday ideas. I so so SOOOOO love these! They are totally adorable! 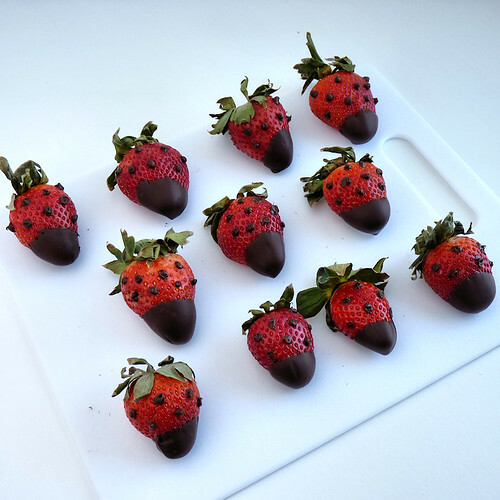 If strawberries are still on sale at Target I am SO making these for Vday! 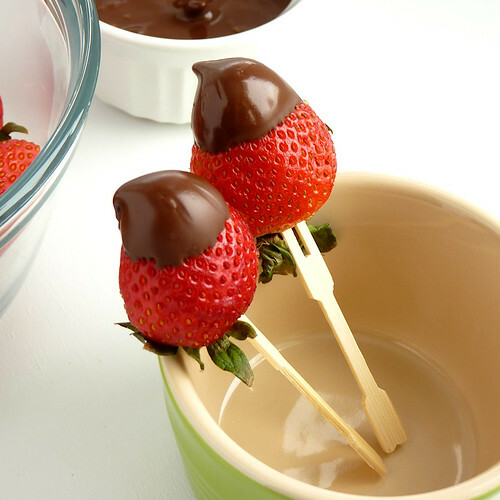 Thanks so much for the cutest Vday recipe ever! PS kind of embarrassing but I almost squealed when I saw these! Show off. You always have to have the cutest, cleverest, smartest little lovebugs on the Internet. :D I'm a big fan of the antennae. That may be my favorite part. (Or should I say "parts?") 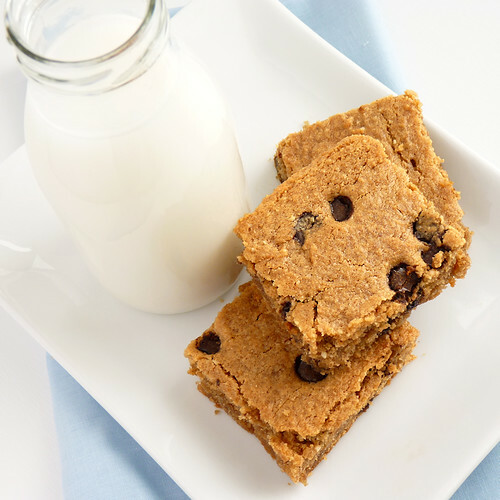 And your gluten-free blondies make me want to go gluten-free. I think I'm going to have to make some asap. I am dead. Dead I tell you. The cuteness of the bugs... too much for one brain to handle... These are so sweet! oh geez! best valentine's day post ever! Ever I tell you! You are too cool for words. I kind of liked the dried up "tails". Cuteness implosion! These are definitely the kind of stink bugs I can get behind!!! Oh my God these are so adorable!!!! I couldn't help but smile when I saw them. Very clever! Ahahaha :))) I love these bugs :))) Can't imagine you made those tiny antennae and painted those tiny faces :) They're adorable! I would immediately fall in love with someone who made me such love bugs! This is a great post! 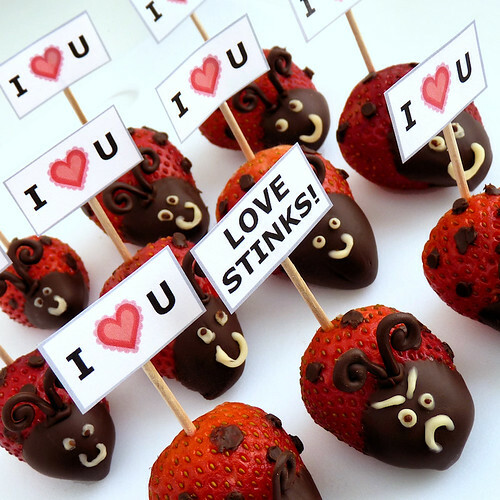 I love the "love stinks" guy. haha! Too cute! 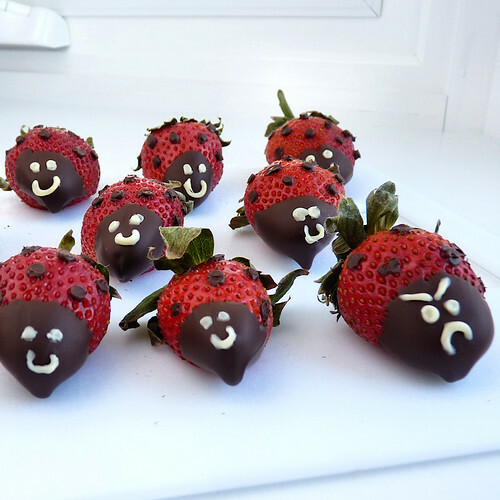 Those are some great pictures and a very innovative way to spice up the strawberries for the holiday. These are a stoke of genius! 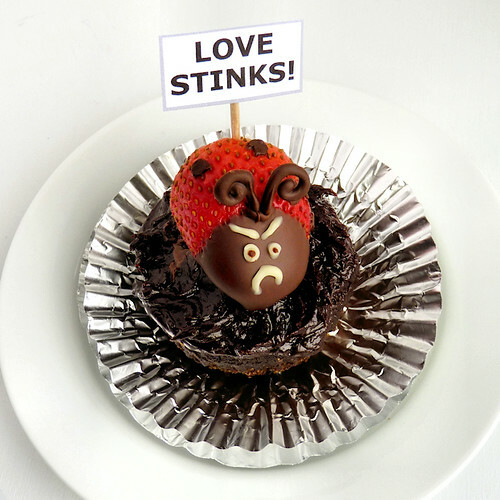 'Love Stinks!' How perfectly cute! You are so creative and have so much patients to make these so perfect! These are so cute. Might have to save this idea for the summer. 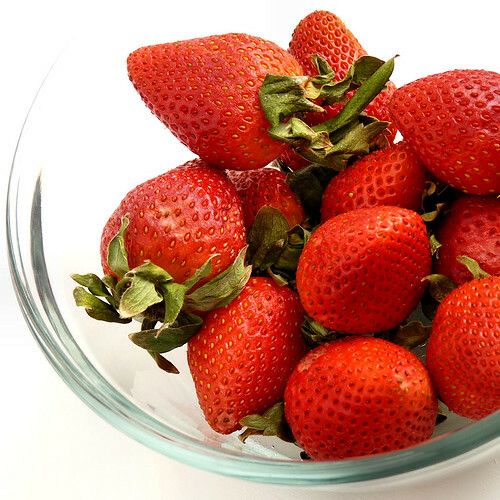 It will be five months before strawberries are in season here. So jealous of those in the warmer climates. Excellent detail in the recipe. I would attempt it, but I fear our strawberry bugs would turn into monsters! Those are so adorable! And the angry loveless lady bug is the best. Thanks for the step-by-step how to! Girl, you are amazing! These bugs are the cutest! You can hog my bandwidth with adorable foodie photos like these anyday. your gluten-free blondies look amazing, River - and i just LOVE the little grumpyfaced love bug. awwww! he needs some cheering up. ahahahahahahaaa! you are too awesome to post such a great tutorial, my friend! i love it! yay! 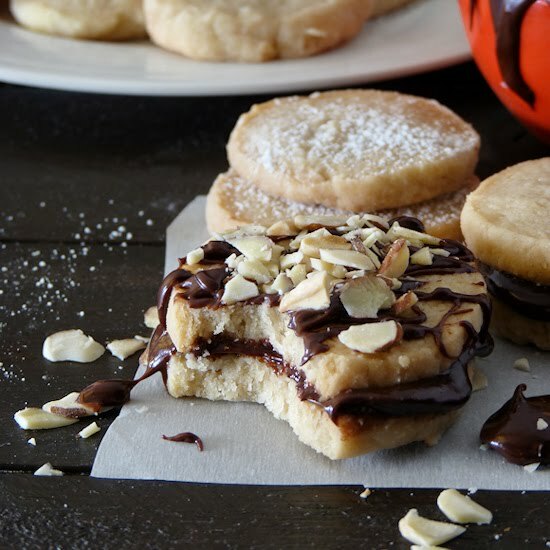 Saw your photo on Foodgawker... LOVE it!! My daughter is asking me as I type if we can make those today! Well done!! These are darling! 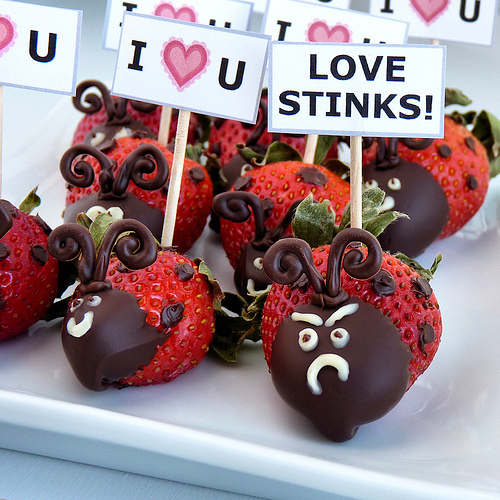 I love chocolate-dipped strawberries and I love the Mr. Grumpypants version! Too too cute. these are the cutest! i tried my hands at these, and although they are not anywhere near as cute as yours, i still love them to bits! Happy V day to u! I love these! my friend and I made them yesterday for valentines and they were a big hit today at school! Thanks a bunch! Your love bugs are the cutest, River! I especially love grumpy bug! They are so adorable! Happy Vegantine's DaY! I'm so glad I came across your blog! Found you via almostveganblog.com and can't stop reading! LOVE everything you post!!! River, these are entirely too adorable! Sooooo cute!!!! 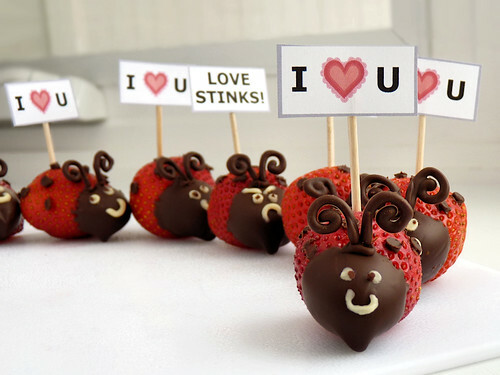 I would swoon if I got one of these for valentines day! Those are just too cute to eat! You are a talented lady! I must try your gluten-free goodies. I'm trying to introduce more GF, but the cupcakes I made were so revolting that we threw them out! I just know your recipe will get us back on that horse! bahahah so cute! I love mr cranky pants! WOW! There ladybugs look too good to be eaten! They are amazing and hilarious! super adorable! Can't wait to share for next Valentine's Day! How can we swtor credits through the internet? We must make it safe and trust those people who buy our's products, and we can buy swtor credits of other games. These are so adorable. What a brilliant idea. Love it! Realmente adorables. MUCHAS GRACIAS por tan genial idea. Los voy a hacer para los amigos del kinder de mi hijo! This is sooooo cute!! You are amazingly creative & talented! I'd love for you to link up with my TGIF kid oriented linky party - http://livinglifeintentionally.blogspot.com/search/label/Linkey%20Parties - I kn0w my readers would love it too!! These are just adorable! Planning to make them for my daughter's Father Daughter Dance this week...having trouble printing out the template and little signs...any suggestions? I can open them in Flikr, but can't figure out how to print them! Thanks in advance for your help! Hi Magan! I believe you should be able to download the template and the signs to your computer and then print them from there. Just click on "download the original size of this photo", and then save it to your computer and print! Eine tolle Idee mit den Erdbeeren. Die sehen toll aus. I am trying to download the antenna template and I cant..
Its cool there is a site out there dedicated to fairness and equity for our youth. Hope more people create sites like this.